Dishoom pays loving homage to the Irani cafés that were once part of the fabric of life in Bombay, where people from any caste or class could have an inexpensive snack or a hearty meal, or just seek cool refuge from the street with a glass of chai. Dishoom Edinburgh pays tribute to the distinguished Scotsman Sir Patrick Geddes (1854-1932). Botanist, ecologist, sociologist, town planner and social reformer, he was a long-time resident of both Edinburgh and Bombay, and had a significant influence on both cities. Our lovingly curated menu serves Bombay comfort food and award-winning drinks, Our all-day menu serves small plates, grills, biryanis, salad plates, hand-made breads and sides, including our signature House Black Daal, simmered over 24 hours for extra harmony (and best mopped up with a handkerchief-thin Roomali Roti). 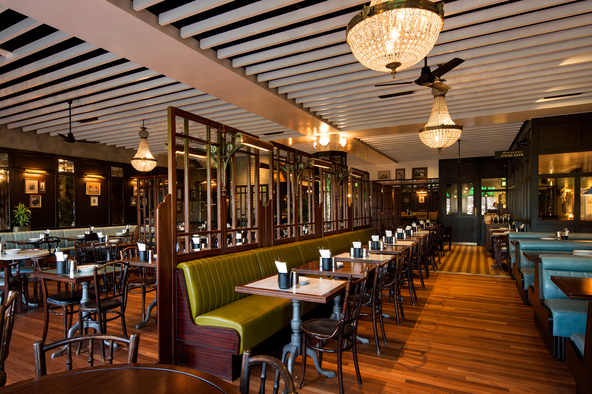 Everything Dishoom does shares its love for Bombay’s culture, heritage and people, and everyone is welcomed with warmth. Permit Room - Good drinkers of Edinburgh, we warmly invite you to step inside a space dedicated to the most delicious and sincere tipples, great music and good cheer. Its name recalls the Bombay Prohibition Act of 1949, which states that all tipplers are required to have a permit to consume alcohol (if only ‘for preservation and maintenance of one’s health’). Hidden beneath the kitchen of Dishoom Edinburgh, herein we combine the illicit undertones of a Permit Room with the best Bombay tradition of Parsi theatre. Settle yourself at the bar and enjoy a treat of a cocktail list. Our award-winning Daru-walla has dreamt up some delicious, never-seen-before cocktails especially for Edinburgh. Or for Edinburgh’s designated drivers, expectant mothers and tee-totallers, we have created a number of totally unique ‘copy tipples’ which look and taste like serious drinks, but are entirely alcohol-free. Every weekend we welcome fantastic DJ’s to the Permit Room who’ll be spinning everything eclectic and rootsy – carefully curated soul, vintage R&B, new wave gems and funky retro Indian beats. We take reservations for groups of up to 12 guests from 9pm until 12:30 Sunday to Thursday and until 2:30 on Friday and Saturday. For reservation enquiries please email edinburghpermitroom@dishoom.com.